Built in 1985, the University of Notre Dame’s 45,000 sq. ft. natatorium includes a 50-meter by 25-yard indoor pool with two movable bulkheads to allow sections of the pool to be blocked off, thus allowing swimming competition and warm-up swimming to occur simultaneously. The design also allows recreational swimming, water polo, instructional swimming, and other aquatic activities. Diving is accommodated with two one-meter boards and two three-meter boards. Spectator seating allows 400 viewers to cheer on the Irish. Support functions (housed below the spectator seating) include men’s and women’s locker rooms, men’s and women’s varsity locker rooms, and men’s and women’s staff locker rooms. Offices for the Notre Dame swimming staff, aquatics directors, and lifeguards are deckside and glass-fronted with a view of the pool. 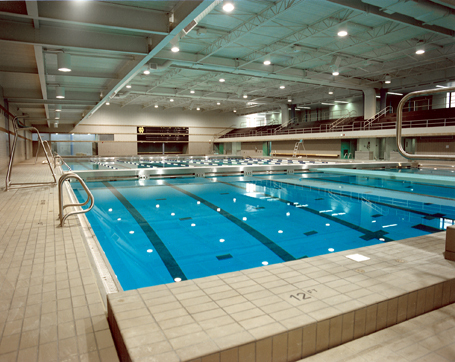 Several deckside instructional areas are located around the pool and feature infrared heat lamps, designed to keep swimmers warm in between events. The pool features a stainless steel racing gutter designed to absorb the bow waves of a swimmer, allowing faster swimming times. Two underwater windows allow critiquing of a diver’s or swimmer’s underwater technique. The lighting system is designed to be adjusted from maximum brightness for television to nearly dark for dramatic synchronized swimming presentations. This facility won the 1987 Facility of Merit Award for outstanding design from Athletic Business Magazine.